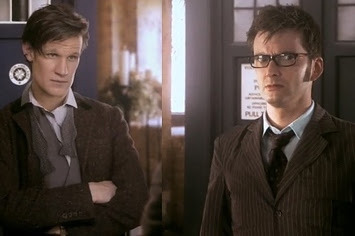 If there is anything "whovians" hate more than waiting, it's waiting for a big event. And there is no event larger in the entire history of Doctor Who than the 50th Anniversary special coming later this year. Fans who follow the series know that we finished the last season off with the Doctor revealing his greatest secret, which (spoilers) was in fact, not his name, but a regeneration that he has kept hidden, because....he's evil? We don't really know the story behind it, but he's played by John Hurt, so it must be cool, right? Fans also know that we will be seeing the return of Billie Piper as Rose Tyler and David Tennant as the Tenth Doctor, much to fan delight. Regarding the special itself, the BBC has been incredibly quiet about details aside from the release date, the special premiering in theaters (in 3D too), and will include a popular Doctor Who alien race that has not appeared since the shows revival in 2005-Zygons. I know what you're thinking. Holy fish-fingers and custard, Batman! For obvious reasons, the internet exploded in excitement....up until the BBC confirmed it as fake. That's right. All those emotions you felt for the past minute or so were for nothing. However, this has got to be one of the best fake trailers I've seen since the infamous "Legend of Zelda" trailer. It is only a matter of time before we get a trailer for the special, given the theatrical release of it in the UK, but until then, enjoy this behind-the-scenes video of Matt Smith and David Tennant discussing the Doctor Who 50th Anniversary. The Doctor Who 50th Anniversary Special will premiere on November 23rd, 2013.